One cannot enter a grocery store without being bombarded with the onslaught of temptations for sweets, chips, and sugary drinks. The advantage of being an adult is the ability to be educated on the contents of the often vibrantly packaged and clever marketing tactics of these food companies. By being educated, we can make healthy choices for our children to help the fight against childhood obesity. However, through clever marketing these food companies entice our children with toys, celebrity endorsements, or a cute cartoon characters, and often leave us the “bad guys” when saying no. Instead of being the bearer of bad news, we can educate our children on the benefits of healthy eating and the importance of the nutrients fruits, vegetables, lean meats, and water, has on their growth and development. 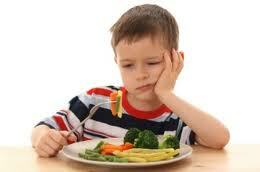 Below you will find some helpful “Do’s” and “Do not’s” to help you plan your child’s daily food menu. When selecting food for your children you don’t have to do anything out of the ordinary or special as they require the same nutrients as you, just in smaller amounts. These nutrients are all the same vitamins and minerals that you get from eating healthy fruits, vegetables, lean proteins, grains, and dairy. When you are preparing a meal for your children, you may want to consider using a smaller plate. This will help you regulate the serving size, prevent them from wasting as much food, and help you ensure they are getting the right amount to eat without overfilling their plate, and then encouraging them to “clean their plate”. Encouraging them to clean their plate can force them to eat too much. Instead, give them a smaller plate with smaller portions, they can always get more. Keep fruits and vegetables washed and ready to consume so they will be easy snacks for your children to grab. Explain to them the various vitamins and antioxidants each one contains to help encourage them to make healthy snacking decisions. The occasional bag of chips or cookies is okay and its part of being a kid, but make sure you read the serving size on the back to help ensure you child doesn’t get too many bad calories. I’m sure we all remember the excitement of digging to the bottom of the cereal box in a mad frenzy to capture the toy that lay at the very bottom of the box. The thought of getting a “reward” for eating cereal was almost as thrilling as purchasing one you wanted from the toy aisle. 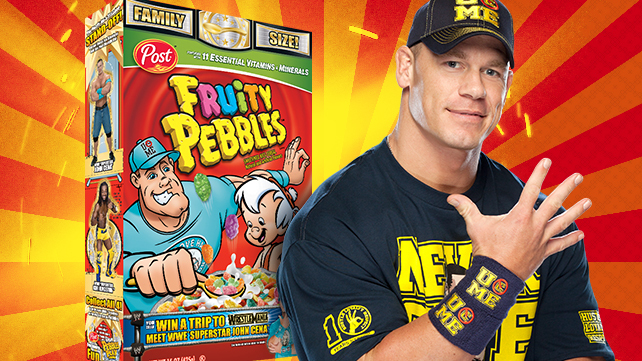 Whether it’s John Cena encouraging your child to apart of “team fruity”, or a funny little leprechaun encouraging you to “follow the rainbow”, the cereal aisle is loaded with colorful boxes filled with sugar and toys. We are often hard pressed to believe that a box with cartoons on it could be unhealthy to our children, but the sugar content of ¾ of a cup of Kellogg’s Honey Smacks Cereal is 15 grams! To put that in perspective that’s 4 teaspoons of sugar! Sugar, whether added or natural, is sugar! With all the drinks marketed to children, and all of these loaded with sugar, it’s no wonder why were in the middle of an obesity epidemic! An 8 Oz serving of Sunny Delight is 130 calories and has 30 grams of sugar, that’s almost 8 teaspoons of sugar! A 12 ounce can of coke contains 140 calories and 39 grams of sugar; it is drinks like these that are contributing to the rapid weight gain among our youth! In an age of fried Twinkies and pretty much fried anything; it’s easy to get something quick and fried. While chicken tenders are my favorite food, it’s hard to deny they are certainly less healthy and provide extra calories and fat versus the much healthier baked option. Many recipes offer baked alternatives to our fried favorites that do not sacrifice the taste, but they exclude the calories. Just remember to keep it simple with fruits, vegetables, lean cuts of meat, fish, chicken, whole grains and dairy. All of these items are found on the exterior of the grocery store while all the boxed items are located on the interior. Children can easily drink most of the caloric intake with sugary juices and soda pop so remember; “no added sugars” does not mean the drink is healthy; water is always the best form of hydration. If your kids think that water is too bland simply squeeze lemon or lime into the water or you can look how to infuse water with various fruits. Childhood obesity is an epidemic, and this is a simple way we can help the keep our children healthy, not a statistic. This entry was posted in Uncategorized and tagged children, diet, fitness, food, health, kids, medicine, nutrition, obesity, summer, weight loss on June 19, 2014 by bigdanmccarthy. Diet soda was created in 1952 by Kirsch Bottling in Brooklyn, NY, in the form of a sugar free ginger ale called “No Cal”. Diet Soda was originally created for people who had health problems like diabetes and contained sugar substitutes. Diet Rite was developed by the RC cola company in 1958, followed by Dr. Pepper in 1962, and Coca Cola in 1963. These companies originally used sweeteners like cyclamates and saccharin; however, cyclamates were banned by the FDA in 1970 because they found evidence the chemical caused cancer in lab rats. 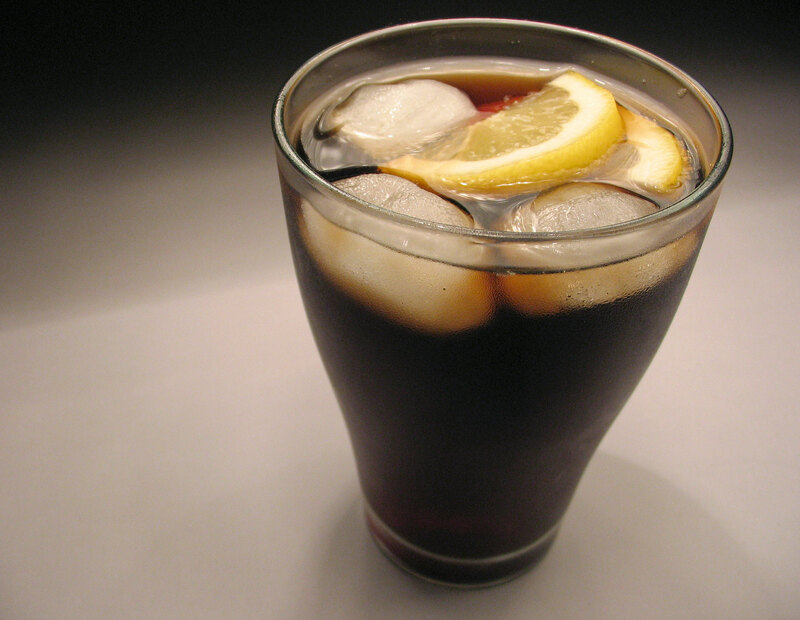 In 1982 Aspartame became the primary sugar substitute used in diet sodas. Since its approval, many consumer advocates have tried to link its usage of aspartame to seizures, headaches, and even cancer. So with all of the ingredients that go into diet soda, is it a safe alternative to its sugary sibling? I decided to do some research to separate known facts from fiction and try to come to a conclusion on a still unknown and speculative topic. Does the artificial sweetener aspartame, cause cancer? According to data, aspartame has been one of the most studied food additives ever tested by the FDA, with countless years of research; they have found no link to aspartame and health problems with the acceptable daily intake of 50 mgs per kilogram of bodyweight. Just to put into perspective what the daily recommended intake is for artificial sweeteners, you would have to drink 21, 12 oz sodas to surpass the FDA’s daily recommended limit. The FDA and 90 other countries, have approved that aspartame is safe for consumption with no proven link to cancer in any trials. Diet Soda actually can trigger weight gain instead of weight loss! Researches from the University of Texas did a study and found that people who consumed one diet soda drink a day had a 70% greater waist circumference than those who did not drink diet soda daily. For those people who drank two or more diet sodas, their waist circumference increased by 500%. From what studies and research have shown, the main reason for the weight gain is that the mind perceives that you are taking in sugar and is expecting the calories. In reality, your body is confused when it doesn’t receive the calories and continues to crave more and more. However, you can effectively avoid weight gain by planning out your diet in advance to substitute fruit to satisfy your sweet tooth. Can the Dye that makes the soda caramel colored cause you to die? Possibly, the dye, 4-methylimidazole, usually known as 4-MI and sometimes 4-MEI, has been shown to possibly cause cancer in studies done on unfortunate lab rats. However, the trace amounts in the soda is very, very minimal, and the FDA and the ABA (America Beverage Association, have thrashed the comments that this causes cancer. The ABA stated, “”leading public health organizations have reaffirmed that caramel coloring, including the trace amounts of 4-MEI found in it, is safe for use in colas and countless other foods.” According to an article a Vanderbilt biochemist told the Time’s that 4-MI would only increase a person’s risk for cancer if they drank 1000 cans a day. California has listed 4-MI as a carcinogen and soda companies that use it will have to produce a warning label. This entry was posted in Uncategorized and tagged cancer, children, diet, drink, fitness, food, health, soda on June 16, 2014 by bigdanmccarthy.